Special pricing on this page available ONLY through October 15 , 2014 !!! Prototype: Swedish State Railways (SJ) heavy ore locomotive consisting of 3 class Dm3 electric locomotives with side rod drive. Used on the ore railroad Lulea - Kiruna - Narvik. Class 1200, with road numbers 1201+1231+1202. Brown basic paint scheme, large headlights, engineer's cabs in the old arrangement, large snowplows (Norrland plows) and SAB rubber spring wheels. 12 type Mas IV three-axle ore cars. The train is authentically weathered. It looks as it did around 1970. Model: The locomotive has an mfx digital decoder and extensive sound functions. It also has 2 controlled, high-efficiency propulsion systems with flywheels, 1 motor in each locomotive unit with an engineer's cab. All 4 driving axles powered in each locomotive unit with an engineer's cab. Traction tires. The dual headlights and a red marker light change over with the direction of travel, will work in conventional operation, and can be controlled digitally. An additional third wide beam headlight above on the locomotives can be controlled digitally. 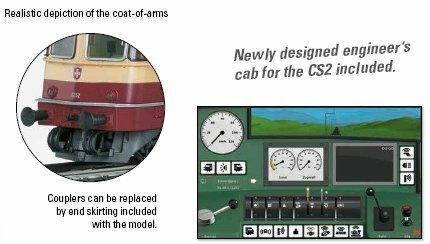 The engine room lighting as well as the cab lighting in Engineer's Cabs 1 and 2 can each be controlled separately in digital operation. An additional marker light can be controlled digitally. The lighting is maintenance-free warm white and red LEDs. All 3 locomotive units are permanently coupled together. There is a close coupling mechanism between the locomotive units. Marker signs for the front end of the locomotive are included separately. The ore cars have detailed construction with partially open floors. There is a detailed representation of the axle mounts with springs and brake rigging. The ore car bodies are constructed of metal. All of the cars have brakeman's platforms, brake wheels, and different car numbers. 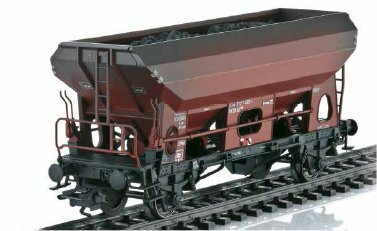 The ore cars have load inserts with real scale sized iron ore. Total length over the buffers approximately 129 cm / 50-3/4". DC wheel set per ore car 3 x 700580. Highly detailed metal construction of the locomotive and the car bodies. Limited to 999 pieces worldwide! Prototype: Norwegian State Railways (NSB) class El 12 heavy ore locomotive as a 2-part side rod electric locomotive. Used on the ore line Lulea - Kiruna - Narvik. Road numbers 2113+2114. Olive green basic paint scheme, large headlights, engineer's cab doors in the old arrangement, large snow plows (Norrland plows) and spoked wheels. The locomotive looks as it did around 1970. Prototype: Freight Train Steam Locomotive class 50 of the German State Railroad Company (DRG), with a coal-Tender Tender Box as unit 2 2 T26 in its original design. With Wagner smoke deflectors, standard cab and long walkway front to the smoke chamber is angled. 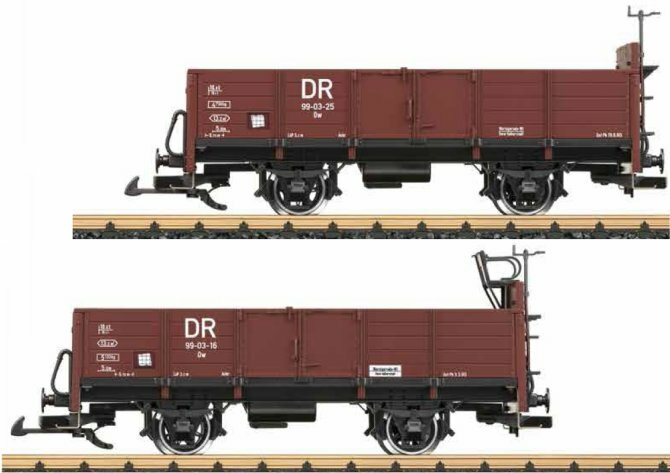 3 DRG flat cars with Junkers F-13, split for rail transport. 2 boxcars type Opole. Wooden transport case Covered goods wagon in the model without and with brakeman's cab. Prototype: German Railroad, Inc. (DB AG) class 146.5 electric locomotive. IC paint scheme. The locomotive looks as it currently does in 2014. Model: The locomotive has an mfx digital decoder and extensive sound functions. It also has a special motor, centrally mounted. 4 axles powered by means of cardan shafts. Traction tires. The triple headlights and dual red marker lights change over with the direction of travel, will work in conventional operation, and can be controlled digitally. The headlights at Locomotive Ends 2 and 1 can be turned off separately in digital operation. When the headlights at both ends of the locomotive are turned off, then the "double A light" is on at both ends. Maintenance-free, warm white LEDs are used for the headlights. The locomotive has 2 pantographs that can be raised by hand but are not wired to take power from catenary. Length over the buffers 21.7 cm / 8-1/2". The class 146.5 electric locomotive is the right motive power for the 43476 bi-level car set. Prototype: The construction began in late 1905. Design and construction of the locomotive only lasted about 4 months. The locomotive was presented at the National Exhibition in Nuremberg in the summer of 1906. July 2, 1907 it set a high-speed record of 154.5 km/h. Only one locomotive with the number 3201 built as a test vehicle. Original locomotive has been preserved and is now at the Nuremberg Transport Museum. Representation of the kerosene lamps. We related the story of the most legendary locomotives of the last two centuries in the issue 05/2014 of the Märklin Magazin. From this article it was clear that the record runs of these impressive locomotives belong to the absolute highlights of railroad history. Discover what the completely new production of the Bavarian S 2/6 has to offer you. She is considered by many to be one of the most unusual manifestations in railroad history and was a novelty not just in the matter of appearance. This imposing locomotive was, for some three decades at the beginning of the 20th century, Germany's fastest steam locomotive. You can admire the loco of the century for the first time at the International exhibition for model railways and accessories IMA, Europe's greatest model railroad event, which takes place from November 20-23, 2014 in Cologne. You will find detailed product information in the new comprehensive catalog for 2014/2015, which will appear shortly. Model: The locomotive has an mfx+ digital decoder and extensive sound functions. It also has controlled high-efficiency propulsion. 2 axles powered. Traction tires. The triple headlights and 1 white marker light (Swiss headlight / marker light code) change over with the direction of travel, will work in conventional operation, and can be controlled digitally. When the locomotive is running "light", the lighting can be changed to one red marker light. The headlights at Locomotive Ends 2 and 1 can be turned off separately in digital operation. When the headlights at both ends of the locomotive are turned off, then the "double A light" is on at both ends as a red emergency stop signal light. Maintenance-free, warm white and red LEDs are used for the lighting. The locomotive has separately applied grab irons. The couplers can be replaced by end skirting included with the locomotive. Length over the buffers 17.1 cm / 6-3/4". World of Operation mfx+ decoder included. Newly designed engineer's cab for the CS2 included. Re 4/4 II engineer's cab for the CS2 with firmware version 3.7 and higher. The Re 4/4 II electric locomotive is the right motive power for the 43866, 43853, and 43854 cars and car sets. Prototype: German Federal Railroad (DB) class VT 95.9 powered rail bus with a class VB 140 trailer car. First production series, in the original crimson paint scheme, with a skylight window above the engineer�s stand. The rail bus looks as it did when delivered and in operation around 1952/53. Authentic weathering. Model: The rail bus has an mfx decoder and extensive sound functions. It also has controlled high-efficiency propulsion with a flywheel in the motor car. 2 axles powered. Traction tires. The rail bus has factory-installed interior lighting in the motor car and the trailer car. The rail bus has dual headlights and dual red marker lights that change over with the direction of travel, will work in conventional operation, and can be controlled digitally. The headlights at the Engineer�s Stand 2 and 1 of the motor car can be turned off separately. Dual red marker lights are on for the trailer car depending on the position of the motor car. Maintenance-free warm white and red LEDs are used for the headlights, marker lights, and interior lighting, and they can be controlled together in digital operation. The rail bus units have a current-conducting drawbar coupling with a guide mechanism between them. An additional non-current-conducting drawbar coupling is included for use in multiple hookups of rail bus sets. When you have a maximum 4-part unit (2 double units), the red marker lights on the trailer car can be turned off by means of a switch. The engineer�s stands and the cars� interiors in the motor car and trailer car allow an open view through the windows. Brake hoses are included and can be mounted on the rail buses. Length of the two-unit set approximately 28.2 cm / 11-1/8"
Headlights on the motor car can be turned off separately at both ends in digital operation. Red marker lights on for the trailer car depending on the position of the motor car. Authentic weathering and advertising design. Delivered with a collector's display case and a certificate of authenticity. Limited edition. Exclusive series in 2014 for the Märklin Stores. Prototype: 3 different type TEE express train passenger cars for the TEE "Helvetia", used between Zürich and Hamburg-Altona. 2 type Avümh 111 TEE compartment cars and 1 type Apümh 121 TEE open seating car. The cars look as they did in the summer of 1975. Model: The cars have underbodies and skirting specific to the car types. One type Avümh car and the Apümh car have Minden-Deutz heavy design trucks with disk brakes, magnetic rail brakes, and separately applied generators as in the prototype. The other type Avümh car has Minden-Deutz heavy design trucks with double brake shoe brakes, magnetic rail brakes, and a separately applied generator. All of the cars have factory-installed LED interior lighting and operating current-conducting couplers. Maintenance-free warm white LEDs are used for the lighting. A pickup shoe is mounted on one of the cars. The 73407 marker light kit can be installed on all of the cars. Total length over the buffers 84.8 cm / 33-3/8". Factory-installed LED interior lighting included on all of the cars. Interior lighting can be controlled by means of item number 43866. Suitable motive power is the Re 4/4 II electric locomotive in a TEE paint scheme that can be found under item number 37349. 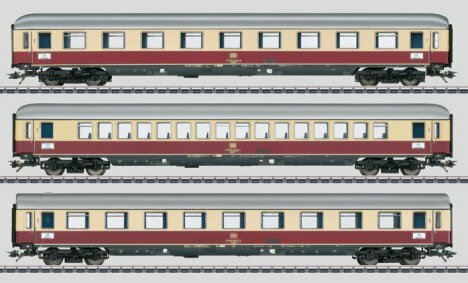 A car set and a dining car with sound to go with this car set can be found as item numbers 43854 and 43866. Prototype: 4 different type TEE express train passenger cars for the TEE "Helvetia", used between Zürich and Hamburg-Altona. 2 type Avümz 111 TEE compartment cars, 1 type Avümh 111 TEE compartment car, and 1 type ARDümh 105 TEE compartment car with a bar. The cars look as they did in the summer of 1975. Model: The cars have underbodies and skirting specific to the car types. The type Avümz cars and type ARDümh car have Minden-Deutz heavy design trucks with disk brakes, magnetic rail brakes, and with and without separately applied generators as in the prototype. The type Avümh car has Minden-Deutz heavy design trucks with double brake shoe brakes, magnetic rail brakes, and a separately applied generator. All of the cars have factory-installed LED interior lighting and operating current-conducting couplers. Maintenance-free warm white LEDs are used for the lighting. A pickup shoe is mounted on one of the cars. The 73407 marker light kit can be installed on all of the cars. One type Avümz car has built-in marker lights. Total length over the buffers approximately 113 cm / 44-1/2". Built-in marker lights included on one car. Suitable motive power is the Re 4/4 II electric locomotive in a TEE paint scheme that can be found under item number 37349. A car set and a dining car with sound to go with this car set can be found item numbers 43853 and 43866. Prototype: German Federal Railroad (DB) type WRümh 132 dining car. Crimson/beige paint scheme. With a steep roof. The car looks as it did in the summer of 1975. Model: The car has an mfx digital decoder and extensive sound functions. Minimum radius for operation is 360 mm / 14-3/16". The car has an underbody and skirting specific to the car type. It also has Minden-Deutz heavy design trucks with disk brakes and magnetic rail brakes. The car has factory-installed LED interior lighting that can be controlled digitally. The table lamps can be controlled separately in digital operation. Different light functions can be controlled separately in digital operation. Maintenance-free LEDs are used for the lighting. 6 Preiser figures are glued in place in the car. The car has operating current-conducting couplers. A pickup shoe is mounted on the car. Length over the buffers 28.3 cm / 11-1/8". Different light functions that can be controlled separately in digital operation. TEE "Helvetia" The "Helvetia" was one of the founding members and thereby one of the veterans of the TEE trains. From the start of the TEE network on June 2, 1957, it connected Northern Germany with Switzerland. Initially, the new class VT 11.5 TEE diesel powered rail cars were available for this route. On April 12, 1965, the Helvetia moved up to the first locomotive-hauled TEE trains in Germany. At first, the fast E 10.12 served as the preferred motive power between Hamburg and Basle SBB. If they were not available, the normal E 10 was also used. Starting in 1971 the new class 103.1 express locomotives took on this task. From Basle SBB the Swiss Re 4/4 II in a TEE paint scheme powered the train. The route of the TEE 72/73 "Helvetia" was as follows: Hamburg-Altona - Hamburg-Dammtor - Hamburg Hbf - Hannover - Göttingen - Frankfurt/M - Mannheim - Karlsruhe - Baden Oos - Freiburg (Breisgau) - Basle Bad - Basle SBB - Zürich Hbf. A change of locomotives had to be done in Frankfurt (Main) Hbf as a stub end terminal as well as in Mannheim Hbf (change of direction). The TEE "Helvetia" ran for the last time on May 26, 1979, since the DB had introduced the dual class "IC-79" system for the change of schedules with the slogan "Every hour � every class". It was not until the summer schedule of 1987 that there was a train again with the same name in the form of the EuroCity 79/78 Hamburg � Zürich. It was replaced in the schedule in 1993/94 by the ICE 71/70 "Helvetia" with the same route. Suitable motive power is the Re 4/4 II electric locomotive in a TEE paint scheme that can be found under item number 37349. Car sets to go with this car can be found as item numbers 43853 and 43854. Prototype: Uerdingen design standard lightweight tank car, used on the Märklin Railroad (MB). The car looks as it did around 1990. Model: The tank car has a brakeman's platform but not a brakeman's cab. DC wheel set: 4 x 32376004. One-time series. Märklin Magazin annual car for 2014. Model: This is a maintenance car for Tim Tender. The car comes in a special paint scheme with themes from the world of the Märklin Start up Club. A conductor's whistle is included with the car to round out the offering. The car has Relex couplers. Length over the buffers 11.0 cm. DC wheel set 2 x 700600. Annual model for members of the Märklin Start up Clubs and for Märklin Insiders. 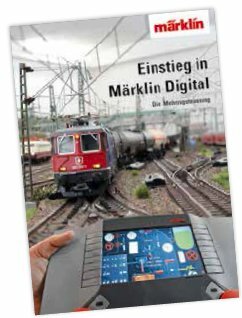 This book is an extensive description of the Märklin Digital system. The necessary components are presented systematically. Important points are simple setup and easy control of a layout with this multi-train control system. Approximately 200 pages. German text only. Prototype: Three-stall roundhouse locomotive shed constructed of brick. Architectural style in use at the beginning of the 20th century. Still in use for museum operations. Model: The stalls are arranged at 15° intervals. 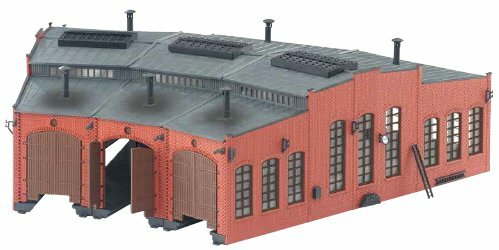 This locomotive shed can be used with the 7286 turntable. It can be used with C Track and K Track (track not included). The usable track length inside the shed is 30 cm / 11-13/16". The doors close automatically when a locomotive enters a stall. A lighting set with 6 maintenance-free LEDs, wired and ready for installation, is included with the shed. A set of additional truss supports is included so that several locomotive sheds can be joined together without walls between them. Dimensions 350 x 461 mm / 13-3/4" x 18-1/8", height 128 mm / 5-1/16". Prototype: Older design refrigerator car without a brakeman's cab. 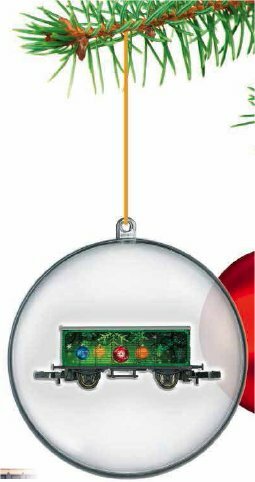 The Christmas car for 2014 is presented in a clear ball. This can be hung on a Christmas tree with the help of the cord included with the car and continues the popular series of festive themes from previous years. Model: The car is painted and lettered to fit into the series of Märklin Magazin annual cars. Length over the buffers approximately 40 mm / 1-9/16". Prototype: 1 class 89 steam locomotive, 1 sliding wall boxcar, 1 low side car. Model: The locomotive is constructed of metal and has a Christmas paint scheme. It has a 5-pole motor and all driving axles are powered. The sliding wall boxcar also has a Christmas paint scheme and there is an appropriate low side car in the set. There is also a kit for a "Christmas Stand" that can be put on the low side car after it (the kit) has been assembled. Other set contents: 2 sections of straight track, 10 sections of curved track, a rerailer, and a 230 volt / 12 VA switched mode power pack with a suitable locomotive controller. A track plan brochure is also included. Train length approximately 167 mm / 6-1/2". This set can be expanded very well with 82720, with the SET track extension sets 8190 or 8191, 8192, 8193, and 8194, or according to your own designs. Prototype: German Federal Railroad (DB) freight car set consisting of six 2-axle freight cars. The train includes 1 type X05 low side car with a brakeman's cab with a Lanz tractor as a load, 1 type X05 low side car with a brakeman's platform with a Lanz half track tractor as a load, 1 tank car with a brakeman's cab, painted and lettered for BV-Aral, 1 insulated boxcar, 1 beer refrigerator car painted and lettered for "Fürstenberg", and an Association type O 10 gondola with board walls, with a load of coal. Model: All of the cars are finely constructed with extensive, prototypical paint schemes and lettering. All of the cars have different car numbers. The tractor models are constructed of metal and are each mounted on a load frame. The gondola has a load insert of "coal". Train length over the buffers approximately 245 mm / 9-5/8". All of the models are a special edition and are not available separately. 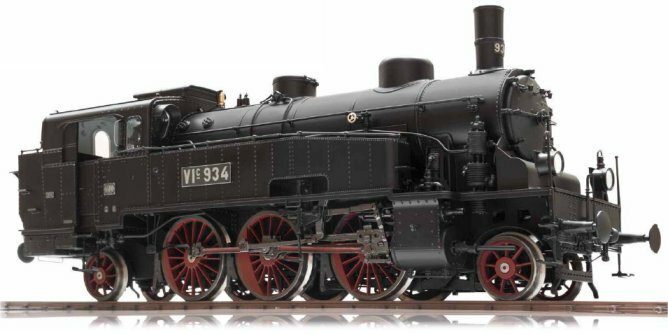 82338 is being produced in a one-time series only for the MHI (Märklin Dealer Initiative). 82338 could be completed to a prototypical Train by using the Locomotive 88984. 82720 -- Christmas Freight 2-Car Add-on Set w/Tree, siding, etc. Prototype: 1 tank car and a low side car with a brakeman's cab. Model: The "Glühwein" tank car and the low side car with a brakeman's cab come in a Christmas paint scheme. Both cars have black wheel sets. The carefully modeled Christmas tree can be placed next to the tracks on your layout or can also be transported on the low side car. This add-on set has material for a storage siding: 1 manual turnout, 3 sections of straight track, 1 section of curved track, and a track bumper. This set is the perfect addition to 81709. Prototype: 3 different privately owned beer cars. 1 x Dortmunder Actien Brauerei, 1 x König-Pilsener, 1 x Holsten Pilsener. All of the cars were used on the German Federal Railroad (DB). Model: The ends of the cars are different. One car has a raised brakeman's stand and two cars have had their brakeman's stands removed. Total length over the buffers 120 mm / 4-3/4". The car with the raised brakeman's stand and a reproduction of the brake handle is a tooling change. Prototype: CB Rail class 285 diesel electric locomotive, leased to the ITL Railroad Company, Inc., Dresden, Germany. Built by Bombardier as a regular production locomotive from the TRAXX type program. Model: The locomotive has a 5-pole motor. Both trucks are powered. Maintenance-free warm white LEDs are used for the lighting that changes white/red with the direction of travel. The locomotive has imitation brake disks. Length over the buffers approximately 87 mm / 3-7/16". Prototype: German Federal Railroad (DB) class 111 general-purpose electric locomotive in an ocean blue / beige paint scheme. Model: Both trucks are powered. The triple headlights change over with the direction of travel. Maintenance-free warm white LEDs are used for the lighting. Inside the locomotive is a screw switch for changing to catenary operation. The locomotive has a reproduction of the engine room. It also has rectangular buffers. Length over the buffers approximately 77 mm / 3". Prototype: Swiss Federal Railways (SBB) class 460 with an advertising paint scheme for the Association of Swiss Locomotive Engineers (VSLF). Model: The locomotive has a 5-pole motor. Both trucks are powered. Maintenance-free warm white LEDs are used for the lighting. The pantographs can be raised and lowered manually. The locomotive is not wired for power supply from the catenary; it can receive power only from the rails. The locomotive has a very fine, extensive paint scheme. Length over the buffers 84 mm / 3-5/16". Prototype: General Motors EMD class E8A six-axle A unit, painted and lettered for the American railroad Pennsylvania Railroad. Model: The locomotive is completely new tooling in cooperation with the firm AZL. It has a new powerful motor. 2 axles powered on each truck. Traction tires for high pulling power. Warm white LEDs are used for the headlights. The locomotive is finely detailed and has extensive, prototypical paintwork and lettering. It also has the Märklin system coupler front and rear. A pilot skirt is included to replace the coupler on the front of the unit. Length approximately 96 mm / 3-3/4". Prototype: German State Railroad Company (DRG) class 64 steam locomotive as it looked in Era II. Model: The locomotive is completely new tooling and is finely detailed. The locomotive body and frame are constructed of metal. There is a reproduction of the brake rigging, rail clearance devices, etc. on the underside of the locomotive. The locomotive has finely detailed valve gear and side rods. It also has larger buffer plates. The dual headlights change over with the direction of travel. Warm white LEDs are used for the headlights. The locomotive has a 5-pole motor. All 3 coupled axles are powered. The wheels are black nickel-plated. Length over the buffers approximately 57 mm / 2-1/4". Finely detailed side rods / valve gear. Reproduction of the braking rigging and rail clearance devices. The Class 64 - The "Bubikopf" as a Jack-of-all-Trades (almost). Between 1928 and 1940, many famous locomotive builders in Germany participated in creating the class 64. As part of the standard design program for the German State Railroad Company, the class 64 was also closely related to other locomotive classes, in particular the class 24, which supplied the boiler and the frame for the driving wheels. A total of 520 units were built of this 12.4 meter / 40 foot 8-3/16 inch long standard design passenger tank locomotive with a 2-6-2T wheel arrangement. Due to its lower axle load and maximum speed of 90 km/h / 56 mph, it could be used on almost all routes, and its successful design allowed a broad range of applications. Its home base was passenger train service, but lightweight fast passenger trains and many a freight train were also among its tasks, which it mastered with bravura. World War II and the division of Germany left behind deep traces in the case of the class 64. The German Federal Railroad acquired 278 locomotives; 115 went to the German State Railroad of East Germany and one locomotive remained in Austria. Like many other classes, the class 64 also acquired a nickname. A modern woman's hairstyle of the time (bobbed hair) was the inspiration for this sturdy, compact locomotive. To what extent this was flattering to the world of women or to the profession of hairstylists is debatable, but to the German Federal Railroad the class 64 was a reliable partner for crews and passengers right up to its retirement in 1974. The museum locomotives that have been preserved enjoy endless popularity. Prototype: German Federal Railroad (DB) class 55. Former Prussian G 8.1. Model: This locomotive has been improved compared to earlier versions of this model. It has finely executed, complete functioning valve gear and rods. The locomotive also has an imitation of the brake rigging, rail clearance devices, larger buffer plates, and much more. The locomotive comes equipped with a 5-pole Mini-Club motor. All of the driving axles are powered. The tender has spoked wheels. Length over buffers 84 mm / 3-5/16". The 82338 car set can be added to this locomotive to make a prototypical freight train. Prototype: Grand Ducal Baden State Railroad (BadStB) class VIc steam tank locomotive. Later the class 75.4. Model: The locomotive is completely new tooling with the frame and locomotive body with boiler constructed of die-cast zinc. Other separately applied parts are mostly made of metal. This is a highly detailed model with many separately applied details and a detailed engineer's cab. The locomotive has older design buffers, does not have a raised addition to the coal bunker, a prototypically long smoke stack, a reproduction of the smoke box door with a central locking mechanism, a water tank hatch that can be opened, a sand dome that can be opened, cab doors that can be opened, and much more. The locomotive has an mfx digital decoder, controlled high-efficiency propulsion, and a sound generator with operating sounds synchronized with the wheels as well as extensive sound functions. The locomotive can be operated with AC power, DC power, Märklin Digital, and DCC. 3 axles powered. The locomotive has a built-in smoke unit with smoke exhaust synchronized with the wheels, cylinder steam, and a steam whistle. The locomotive has dual headlights that change over with the direction of travel with a reproduction of the gas lamps for oil gas and a light color correct for the era. The headlights will work in conventional operation and can be controlled digitally. Maintenance-free warm white LEDs are used for the lighting. Cab and firebox lighting are included. The locomotive has a prototype reproduction coupler on the front and a claw coupler on the rear. Both can be changed to the other type of coupler. An accessory package with a prototype reproduction coupler and a claw coupler, smoke fluid, and figures of an engineer and fireman is included with the locomotive. Minimum radius for operation is 1,020 mm / 40-1/8". Length over the buffers 39.7 cm / 15-5/8". Prototype: German Federal Railroad (DB) class 75.4 10-11 steam tank locomotive. Former Baden VIc. Model: The locomotive is completely new tooling with the frame and locomotive body with boiler constructed of die-cast zinc. Other separately applied parts are mostly made of metal. This is a highly detailed model with many separately applied details and a detailed engineer's cab. The locomotive has a bell separately applied behind the smoke stack, does have a raised addition to the coal bunker, a short smoke stack, a smoke box door without a central locking mechanism, a water tank hatch that can be opened, a sand dome that can be opened, cab doors that can be opened, and much more. The locomotive has an mfx digital decoder, controlled high-efficiency propulsion, and a sound generator with operating sounds synchronized with the wheels as well as extensive sound functions. The locomotive can be operated with AC power, DC power, Märklin Digital, and DCC. 3 axles powered. The locomotive has a built-in smoke unit with smoke exhaust synchronized with the wheels, cylinder steam, and a steam whistle. The locomotive has triple headlights that change over with the direction of travel and have a light color correct for the era. The headlights will work in conventional operation and can be controlled digitally. Maintenance-free warm white LEDs are used for the lighting. Cab and firebox lighting are included. There is running gear lighting on the left side of the locomotive. The locomotive has a prototype reproduction coupler on the front and a claw coupler on the rear. Both can be changed to the other type of coupler. An accessory package with a prototype reproduction coupler and a claw coupler, smoke fluid, and figures of an engineer and fireman is included with the locomotive. Minimum radius for operation is 1,020 mm / 40-1/8". Length over the buffers 39.7 cm / 15-5/8". Model: The car is completely new tooling for the "Ulm" car type and has extremely finely detailed plastic construction with many separately applied details. The car has a brakeman's platform, wooden boards, wooden stakes on the sides, and metal stakes on the ends. The stakes are removable and can be stored in the stake box. The car comes with claw couplers installed. Prototype reproduction couplers and brake hoses are included for installation on the car. Minimum radius for operation is 1,020 mm / 40-1/8". Length over the buffers 37.8 cm / 14-7/8". Prototype: German Federal Railroad (DB) type Rmms 33 "Ulm" stake car with a Lanz "Ackerluft" Bulldog as a load. Model: The car is completely new tooling for the "Ulm" car type and has extremely finely detailed plastic construction with many separately applied details. The car is the DB version with steel boards, pressed metal side stakes, and steel end stakes. The stakes are removable and can be stored in the stake box. Prototype reproduction couplers and brake hoses are included for installation on the car. Minimum radius for operation is 1,020 mm / 40-1/8". Loaded with a metal model of a Lanz "Ackerluft" Bulldog, mounted on a real wood load frame. Length over the buffers 37.8 cm / 14-7/8". A model of a Lanz "Ackerluft" Bulldog, mounted on a real wood load frame, included. Prototype: German State Railroad (DRG) type Rmm Ulm stake car with a Lanz rail unit as a load. Model: The car is completely new tooling for this car type and has extremely finely detailed plastic construction with many separately applied details. This is the version without a brakeman's platform, with metal boards, without stakes. The car comes with claw couplers installed. Prototype reproduction couplers and brake hoses are included for installation on the car. Minimum radius for operation is 1,020 mm / 40-1/8". Length over the buffers 37.5 cm / 14-3/4". Prototype: German Federal Railroad (DB) class 38.10-40 steam locomotive with a tender, with Wagner smoke deflectors. Former Prussian P8. Model: The locomotive and tender are constructed mainly of die-cast metal. The locomotive has a can motor with a bell-shaped armature and a flywheel and is mounted in the boiler. The locomotive has a built-in digital decoder and a sound generator with the formats DCC, Selectrix, and Selectrix 2. The locomotive and tender are close coupled. 3 axles powered. Traction tires. The locomotive has dual headlights with warm white LEDs. Length over the buffers 116 mm / 4-9/16". Highlights: New tooling. Digital sound with many functions. Prototype: Type K 15 Association design gondola with hinged hatches, 2-axle tank car, type G 07 boxcar, 2-axle refrigerator car used by a privately owned brewery. Model: The cars have close coupler mechanisms. Total length over the buffers 230 mm / 9-1/16". Prototype: German Railroad, Inc. (DB AG) Talgo design hotel cars. Version for the DB Nachtzug / Night Train. 2 end cars (Machinery Cars I and II), 2 dining cars (lounge and bistro), and 2 sleeping cars (1st class). Model: The cars have articulated running gear with snap-in special couplings between the cars. Total length over the buffers 482 mm / 19". This train can be lengthened with the 15551 add-on set. Highlights: Special running gear with single-axle trucks. Closed transitions between the cars. DB Talgo Night Train In June of 1992, the German Federal Railroad took a daring, unusual step. It ordered a first series of five trains of the TalgoPendular 200 type at a cost of 124 Million German Marks (= 63.3 million Euros) from the Spanish firm Talgo. 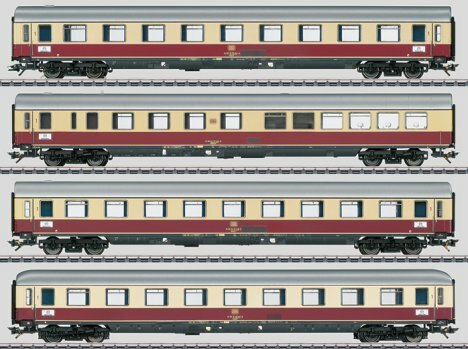 All of these trains belong to the sixth generation of Talgo design, of which the Talgo prototype from 1942 is the first generation. The Talgo articulated trains are the discovery of the Spanish engineer Alejandro Goicoechea, who wanted to compensate for the disadvantages of heavy passenger cars that were hard on track by coming up with a new car concept. In 1942, Goicoechea founded together with the financier Oriol the firm Patentes Talgo S.A. in Madrid and presented a first prototype in the shape of the Talgo I with articulated, three-point mounted car elements and single wheels. "Talgo" stands for "Trenarticuladoligero Goicoechea Oriol" (= Lightweight articulated train by Goicoechea and Oriol). With Talgo, each car body has a single wheel truck only at one end, while the other end is supported by an adjoining car. Only the leading end car has two trucks. The short car bodies cause the stub end axles for the wheels to act almost radially on curves so that the wheel flanges rub less against the rails compared to conventional cars and thus cause less rail wear. This design allowed the Talgo trains to roll rather lightly and quietly on curves. The basic concept of the Talgo trains was not changed over the years but was developed further of course. These were radial running gear steering, the passive tilt body ability "TalgoPendular", as well as the "Talgo RD" adjustable running gear for different gauges. The running gear and the tilt body technology on the DB's "TalgoPendular" are closely tied to one another in terms of design. The radial controlled single wheel running gear has air springs beneath the roof. This high-mounted spring arrangement together with the car body suspension to a turning of the car body around a virtual pivot axis that is above the roof. The centrifugal forces that occur when negotiating a curve tilts the car body up to 3.5 degrees to the outside of the curve and thereby reduces considerably the side forces affecting the passengers. The first series delivered comprised 112 cars and regularly scheduled Talgo service was initiated in Germany with the start of the summer schedule on May 29, 1994. These Talgo Night Trains ran in Germany initially as InterCityNight (ICN), later as DB Nachtzug (NZ), and at the end as DB CityNightLine (CNL) between Berlin and Munich, between Munich and Hamburg as well as between Bonn and Berlin, and between Stuttgart and Hamburg for a time. Each train consisted of a maximum of 22 cars in the categories Comfort Sleeping Car (with shower and toilet in each compartment), Comfort Seating Car with reclining seats (one of the cars suitable for handicapped passengers), Slumber Coaches, Bistro and Reception Cars, Dining Cars as well as two machinery end cars with baggage compartments, bicycle racks, and ski racks. The Talgo trains replaced conventional, locomotive-hauled overnight trains, and four of them were in operation every night. The fifth set served as a reserve. With the delivery of two additional trains in August of 1996, the DB expanded its Talgo use on September 29, 1996 to a six-day turnaround. In December 2008, operation of the Talgo overnight trains ended after 15 years due to costs and to the upcoming cost-intensive main maintenance deadlines. Prototype: German Railroad, Inc. (DB AG) Talgo design hotel cars. Version for the DB Nachtzug / Night Train. 2 sleeping cars (1st class) and 1 slumber coach (2nd class with open seating area). Model: Add-on set with 3 cars for the 41773 set. The cars have articulated running gear with snap-in special couplings between the cars. Lengthens the train by 245 mm / 9-5/8". Prototype: German Federal Railroad (DB) class V 90 heavy switch engine. Crimson basic paint scheme. Original version. The locomotive looks as it did around 1967. Use: Switching work and freight trains. Model: The locomotive has a built-in digital decoder for operation with DCC, Selectrix, and Selectrix 2. The motor has a flywheel. 4 axles powered. Traction tires. Triple headlights and dual red marker lights change over with the direction of travel, will work in conventional operation, and can be controlled digitally. The locomotive has cab lighting. It also have separately applied grab irons. The locomotive has a different road number from 16292. Length over the buffers 89 mm / 3-1/2". Highlights: Completely new tooling. Body and frame constructed of metal. Warm white LEDs for lighting. Cab lighting. Prototype: German Federal Railroad (DB) class 038.10-40 steam locomotive with a tender, with Witte smoke deflectors. Former Prussian P8. 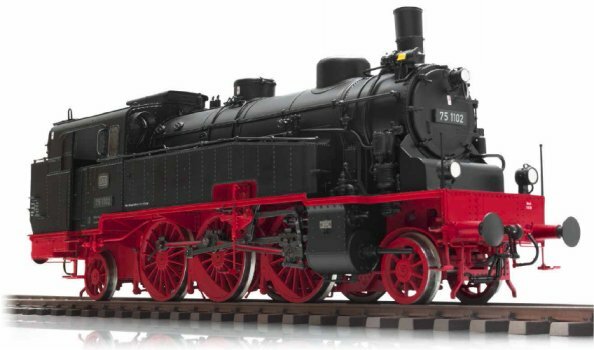 Model: The locomotive and tender are constructed mainly of die-cast metal. The locomotive has a built-in digital decoder for operation with DCC, Selectrix, and Selectrix 2. The locomotive has a motor with a flywheel, mounted in the boiler. The locomotive and tender are close coupled. 5 axles powered by means of side rods. Traction tires. Length over the buffers 116 mm / 4-9/16". By 1921, eight builders had produced 1,168 units of the class G 12 for the Prussian State Railroad Administration (P.St.E.V.) and the DRG. Another 321 similar units went to other railroads. In 1925, the class G 12 was changed by the German State Railroad Company to the class 58, whereby the Prussian G 12 was given the class designation 5810-21. The German Federal Railroad still had 152 locomotives of this class on its roster in 1950. Prototype: Swiss Federal Railways (SBB/CFF/FFS) class Re 460 fast general-purpose locomotive. Advertising locomotive for the Association of Swiss Locomotive Engineers (VSLF). Road number: 460 105-0. The locomotive looks as it currently does in real life. Use: Passenger trains. Model: The locomotive has a 14-pin digital interface connector and a motor with a flywheel. 4 axles powered. Traction tires. The locomotive has new LED headlights with the Swiss headlight / marker light code (can be turned off). Length over the buffers 115 mm / 4-1/2". Highlights: Swiss headlight / marker light code. Warm white LEDs for headlights. Cars with item numbers 15083, 15084, 15085, and 15086 go well with this locomotive. Model: The models are finely detailed with rotating axles and modelled interiors. The front axle can be turned for curves. Length 72 mm / 2-7/8". Highlights: New tooling. Front axle can be turned for curves. Model: The locomotive has a digital decoder and extensive sound functions. It also has controlled high-efficiency propulsion with a flywheel. 2 axles powered. Traction tires. The engineer's cabs and the engine room have interior details. Handrails and other details are separately applied. The roof is finely detailed, with transversely mounted support insulators on the pantographs, as well as the bell-shaped insulators and fluted insulators. The triple headlights and dual red marker lights change over with the direction of travel, will work in conventional operation, and can be controlled digitally. The headlights at Locomotive End 2 and 1 can be turned off separately from each other. When the headlights are turned off at both ends of the locomotive, then the "double A" lights function is on at both ends. The lighting is maintenance-free, warm white and red LEDs. Brake hoses, heating lines, and covers for the pilot trucks are included. Length over the buffers 18.3 cm / 7-3/16". Highlights: Prototypical tooling changes. Finely detailed metal construction. Digital decoder and extensive operating and sound functions included. Prototype: Swiss Federal Railways (SBB/CFF/FFS) class Re 460 fast general-purpose locomotive. Advertising locomotive for the Association of Swiss Locomotive Engineers (VSLF). Road number: 460 105-0. The locomotive looks as it currently does in real life. Model: The locomotive has a digital decoder and extensive sound functions. It also has controlled high-efficiency propulsion. 2 axles powered. Traction tires. The triple headlights and dual red marker lights change over with the direction of travel, will work in conventional operation, and can be controlled digitally. The headlights at Locomotive Ends 2 and 1 can be turned off separately in digital operation. The long distance headlights can be controlled digitally. The lighting can be changed between the Swiss headlight / marker light code and white headlight / red marker light code. Maintenance-free, warm white and red LEDs are used for the lighting. The locomotive has separately applied grab irons. The engineer's cabs have interior details. Length over the buffers 21.3 cm / 8-3/8". Highlights: Swiss headlight / marker light code. Digital decoder with extensive sound functions. 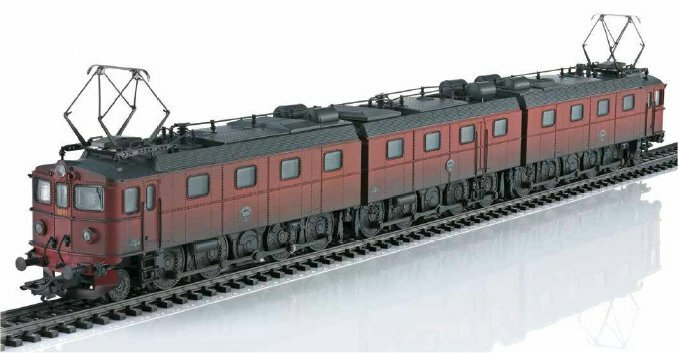 This model can be found in an AC version in the Märklin H0 assortment under item number 37467. Model: The minimum radius for operation is 360 mm / 14-3/16". One rebuild car has "Pennsylvania" swan's neck style trucks and one has Prussian standard design trucks. The "Silberling" / "Silver Coins" car has Minden-Deutz lightweight style trucks. All of the cars have factory-installed interior lighting with warm white LEDs. The "Silberling" / "Silver Coins" car has factory-installed red marker lights. Total length over the buffers 73.4 cm / 28-7/8". Highlights: "Silberling" / "Silver Coins" car has factory-installed red marker lights. All of the cars have factory-installed LED interior lighting. Train route: Augsburg - Donauwörth - Treuchtlingen - Nürnberg. Model: The minimum radius for operation is 360 mm / 14-3/16". The temporary baggage car has "Pennsylvania" swan's neck style trucks. The express train passenger cars have Minden-Deutz heavy design trucks. All of the cars have factory-installed interior lighting with warm white LEDs. Total length over the buffers 83.2 cm / 32-3/4". Highlights: The type MDyge 986 temporary baggage car is new tooling. All of the cars have factory-installed LED interior lighting. Train route: Augsburg - Donauwörth - Treuchtlingen - Nürnberg. 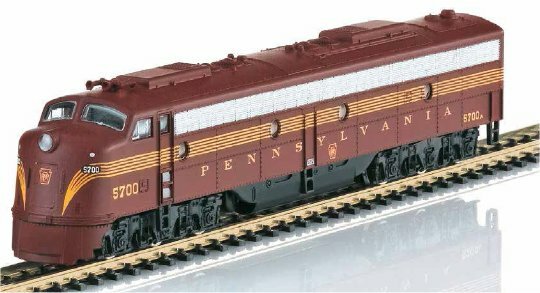 The class 117 electric locomotive, item number 22176, is the ideal add-on for the 23498 and 23499 fast passenger train car sets. 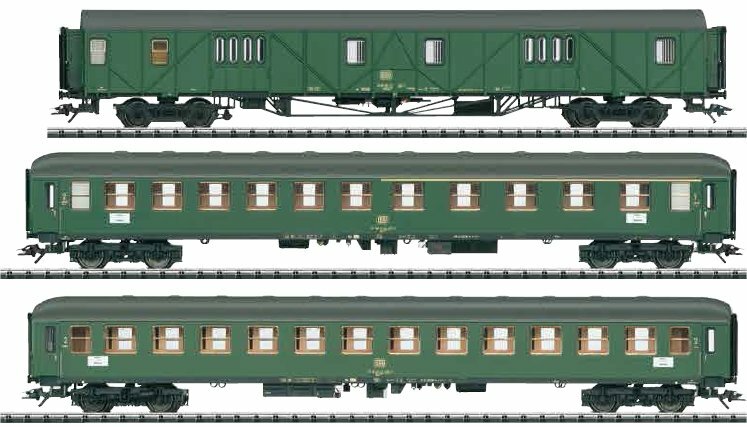 This fast passenger train car set can be found in an AC version in the Märklin H0 assortment under item number 43990. German Federal Railroad (DB) class E 10 electric locomotive in an Era III version in a basic steel blue paint scheme. This new LGB model is finely detailed and extensively paint and lettered. All of the wheel sets are powered by two powerful motors. It has an interface connector for installation of the 55028 decoder. In addition, the locomotive has inset windows, traction tires, and LED headlights that change over with the direction of travel. Center buffer beams are included that can be installed on the locomotive. Length over the buffers 60 cm / 23-5/8“. • Built-in DCC interface connector. • 2 powerful motors, both wheel sets in both trucks powered. • LED headlights that change over with the direction of travel. • Pantographs can be raised and lowered manually. • Center buffer beams included that can be installed on the locomotive. Rhaetian Railroad class Ge 4/4 II electric locomotive, road number 620, in a paint scheme as the anniversary locomotive for the 100th anniversary of the railroad line Bever – Scuol. This model is only being produced in a one-time series. It has extensive features. The model has many sound functions such as traction motor sounds, train announcements, station announcements, compressor, whistle, main blower, the sound of brakes squealing, etc. The locomotive has triple headlights that change over with the direction of travel. It also has pantographs that are raised and lowered electrically with the change in direction. In addition, the locomotive has cab lighting, general-purpose sockets, traction tires, and cab doors that can be opened. The locomotive is equipped with 2 powerful Bühler motors driving all of the axles. New features are flush fitting windows in the engineer‘s cabs and engine room, separately applied rear view mirrors on the right side of the locomotive, sockets on the end, and antennas on the roof. The locomotive is also prototypically and extensively painted and lettered. Length over the buffers 57 cm / 22-7/16“. Rhaetian Railroad class Ge 4/4 II electric locomotive, road number 623, in a paint scheme as the anniversary locomotive for the 125th anniversary of the Rhaetian Railroad. This model is only being produced in a one-time series. It has extensive features. The model has many sound functions such as traction motor sounds, train announcements, station announcements, compressor, whistle, main blower, the sound of brakes squealing, etc. The locomotive has triple headlights that change over with the direction of travel. It also has pantographs that are raised and lowered electrically with the change in direction. In addition, the locomotive has cab lighting, general-purpose sockets, traction tires, and cab doors that can be opened. The locomotive is equipped with 2 powerful Bühler motors driving all of the axles. New features are flush fitting windows in the engineer‘s cabs and engine room, separately applied rear view mirrors on the right side of the locomotive, sockets on the end, and antennas on the roof. The locomotive is also prototypically and extensively painted and lettered. Length over the buffers 57 cm / 22-7/16“. 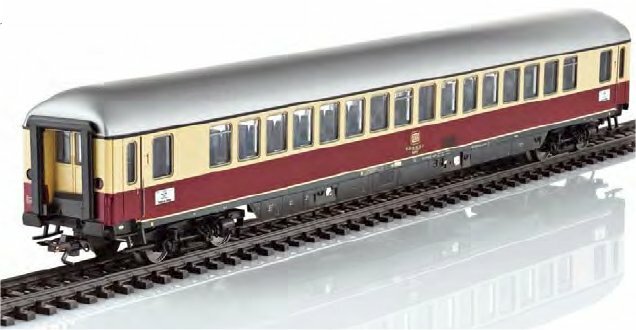 This car set consists of 2 individually packaged German State Railroad (DR) Era IV type Ow gondolas with board superstructure and double sheet metal doors. One car has a brakeman‘s seat. Both models have spoked metal wheels and are lettered extensively and finely. Both cars are individually packaged. Length over the buffers per car 30 cm / 11-13/16“. 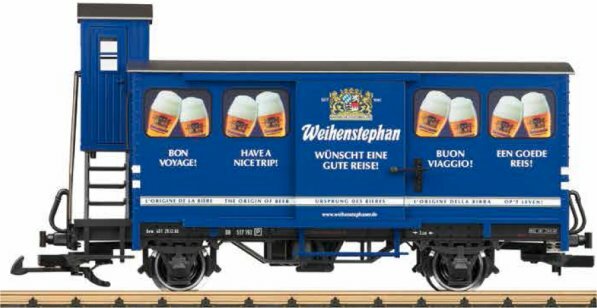 German Federal Railroad (DB) type Gw boxcar with advertising for the Weihenstephan Brewery. This model has Era III paint and lettering. All of the doors on the car can be opened. In addition, the car has metal wheel sets. Length over the buffers approximately 33.5 cm / 13-3/16“. 2-axle, narrow gauge boxcar lettered for the Reisewitz Brewery, Dresden, Germany. This model is being made exclusively for MHI dealers. It is finely imprinted and extensively painted. The sliding doors can be opened, and the car has spoked metal wheels. Length over the buffers 33.5 cm / 13-3/16“. DB AG four-axle stake car. It has Era V paint and lettering. The car is equipped with metal solid wheels. Center buffer beams are included for converting the model to center buffers. Length over the buffers 66 cm / 26“. Also included in the set is a model of a Scania R Highline V8 semi-truck rig for lumber and logs with a load of logs. Length of the model 62 cm / 24-3/8“.